When I’m sighting in or doing load development for a hunting rifle I tend not to use a typical competitive benchrest set up. The small front bags that fit on a benchrest stand tend to be on the firm side which is fine for a bench rifle but not for a sporter. A hard support on the fore-end tends to make the rifle shoot high by comparison to when you shoot in the field which will typically be either unsupported from standing, kneeling, sitting or prone, or using a makeshift rest, such as a tree trunk for example. So, when I’m sighting in especially I’ll choose to use a big softer bag and I may put that on a benchrest stand, or on another sand bag to bring it up to a nice height. Especially if sighting in or doing load development with a rifle that has a decent amount of recoil then I prefer to get the rifle up a little higher off the bench so I can absorb the recoil better. The Protektor Standard Front Bag is a nice old fashioned design that just works. (Picture courtesy Sinclair International). For the rear bag I prefer to have something as conventional as possible so I would tend to opt for something like the Protektor Rabbit Ear Bag. For the rear bag something big, soft and stable such as the Protektor Rabbit Ear Bag works well. (Picture courtesy Sinclair International). The rear bag is a mission critical part of your bench resting kit. 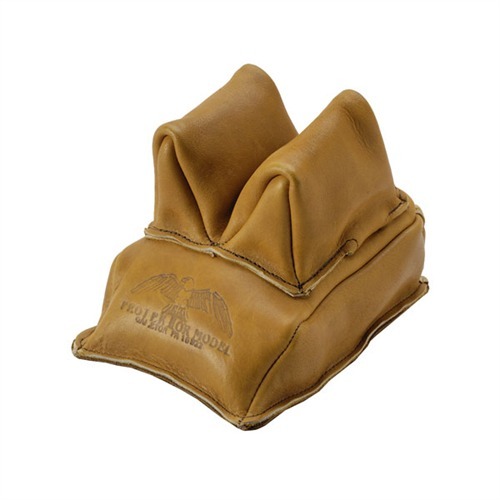 It needs ears to ensure lateral stability, and you will be fine aiming your rifle with this bag by strategically squeezing it with your non shooting hand until you get the exact stable sight picture you need. This can be done with rifles of the .300 Magnum class on up into .375 Holland and Holland Magnum territory. Above that as we venture into the likes of the .416 Rigby and above the shooter will probably need to use their non-trigger hand to support the fore-end depending on the shooter, the loading, and the stock design. A .416 Rigby tends to jump off the front bag when fired and if it lands on the metal parts of a bench rest stand the result will not be good for that expensive English walnut. You can find the Protektor Standard Front Bag at Sinclair International if you click here. 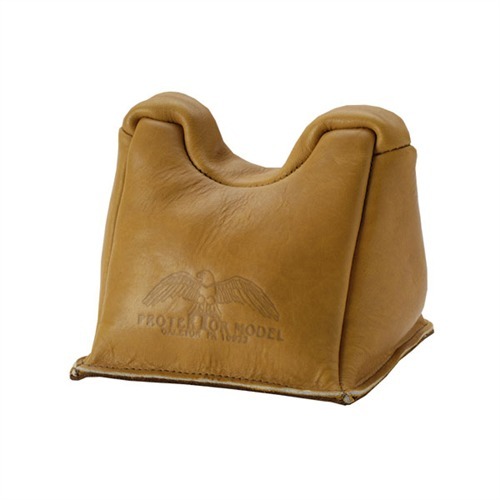 You can find the Protektor Rabbit Ear Rear Bag at Sinclair International if you click here. You don’t have to have benchrest bags or even a bench rest table to sight in your rifle, or even do load development. You can use a back pack with a blanket or two in it to support the fore-end and a sand sock to support the rear and lie down to do it prone. I just find the benchrest to be a whole lot more comfortable and controlable. If I’m doing load development I expect to be at the range for hours experimenting – and a comfortable experimenter is a happy experimenter.